What on earth can a 12 month old get out of a yoga class you ask?Only an abundance of developmental benefits! 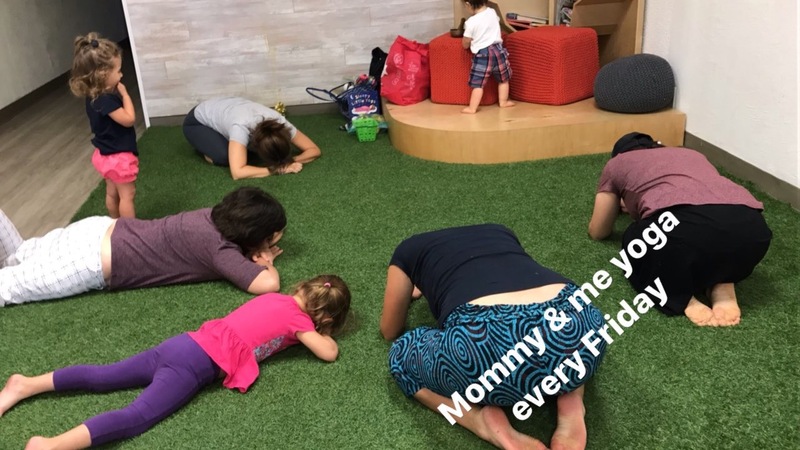 2 months ago, YogaTwist debuted a Mommy and me toddler yoga class at the sweet Lila Sky boutique space that has been ommmmazing! In just 5 classes, there have been so many benefits for the kids and their mommies! Activities range from taking turns sounding the Tibetan healing bowl/chimes and chanting omms and yumms (while rubbing our tummies!) to picture books with yoga poses to act out, clapping and rhythm games, toe-go picking up Pom poms with our toes (fine motor skills), songs with interactive hand motions to help with gross motor skills and hand/eye coordination, breathing and of course a lovely relaxation with mama (more FOR mama? ), complete with floating bubbles and soft music. This class promotes emotional health with stretches and movement, balancing, and bonding for mother and child and is a great way to socialize as well! It is so special sharing yoga with the different generations (we even have a young grandmother who comes too!) check out the magic happening almost every Friday morning! Contact Viviana for details namasté and come out to play! Hi! Welcome to my very first ever BLOG! I know I am a little behind the times, cause it seems everyone is doin it! But, u know, I have been a little busy workin on my LIFE MISSION, and I can’t wait to share it all with you! I am so humbled and honored as a yoga instructor to be able to hold space and share yoga on and off the mat with kids of ALL ages! When I say all ages, I mean like Pre-natal mamas with baby still in the tummy, to 12 months, school kids, teens, adults to Grandparents and everyone in between! It is my passion and my mission to connect to as many souls as possible, especially the children, so that we can co-create an amazing and positive future! ‘Yoga’ means to connect, so that is the main focus. Connecting and/or re-connecting to ourselves, our friends and family, and ultimately to the entire world and universe! Each one of us is so powerful and can make a huge difference. One at a time, we can raise the consciousness on our planet and ultimately heal the world! Doesn’t that sound awesome! It is!!! In my kids classes the chant “Peace begins with me” is often heard….and that is what it’s all about. When we tap into our own inner peace, no matter what is going on around us….that is where the magic can begin! So join Yogatwist on this ommmmazing journey and discover it for yourself! Magic happens! Yogatwistin by the pool! What a great hippity hoppity pre Easter kids class! Hip hip hurray! Love working with @Cindy’s Fitness Experience! 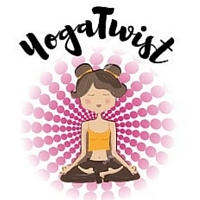 We're happy to welcome YogaTwist as a Heal The Planet Day vendor! The mission of YogaTwist is to reach as many kids as possible with yoga and mindfulness to help them stay balanced, positive, focused in today's world. Glitter with the grads! Making “feelings jars” after our great YogaTwist training weekend! What a super weekend we had at the latest YogaTwist training! 🙏💕🤸🏻‍♀️🧘🏻‍♀️Feelin grateful!